Identifying the natural clusters of nodes in a graph and treating them as supernodes or metanodes for a higher level graph (or an abstract graph) is a technique used for the reduction of visual complexity of graphs with a large number of nodes. In this paper we report on the implementation of a clustering algorithm based on the idea of ratio cut, a well known technique used for circuit partitioning in the VLSI domain. The algorithm is implemented in WINDOWS95/NT environment. 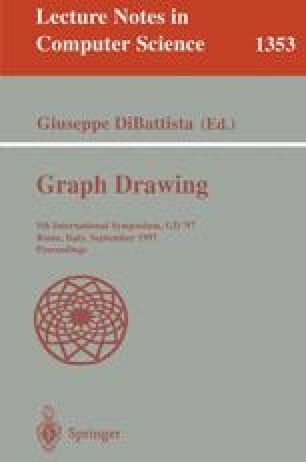 The performance of the clustering algorithm on some large graphs obtained from the archives of Bell Laboratories is presented. This work was partially supported by a grant from Tom Sawyer Software under NIST Advanced Technology Program.